Found b&w photo marked up by someone in blue pen. The photo was enlarged, cut out, mounted on period sheet music, and then colored with photo dyes, pen and ink. Rubber stamp denoting it as part of the wabi sabi series. Benjamin Blayton was born on December 6, 1897, in Lincoln County, Oklahoma. He worked on his family's farm from a young age before moving to Washington, D.C. where he became an electrician. 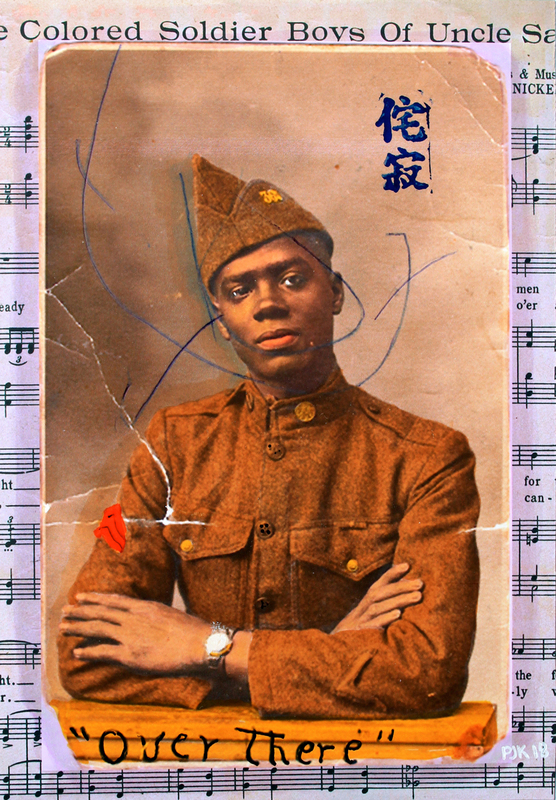 At the age of 20, he enlisted in the Army on January 5, 1918, and became a member of the Buffalo Soldiers which was formed on September 21, 1866 and was primarily made up of African American soldiers. The Buffalo Soldiers were responsible for supporting westward expansion by helping build new settlements and protecting settlers.